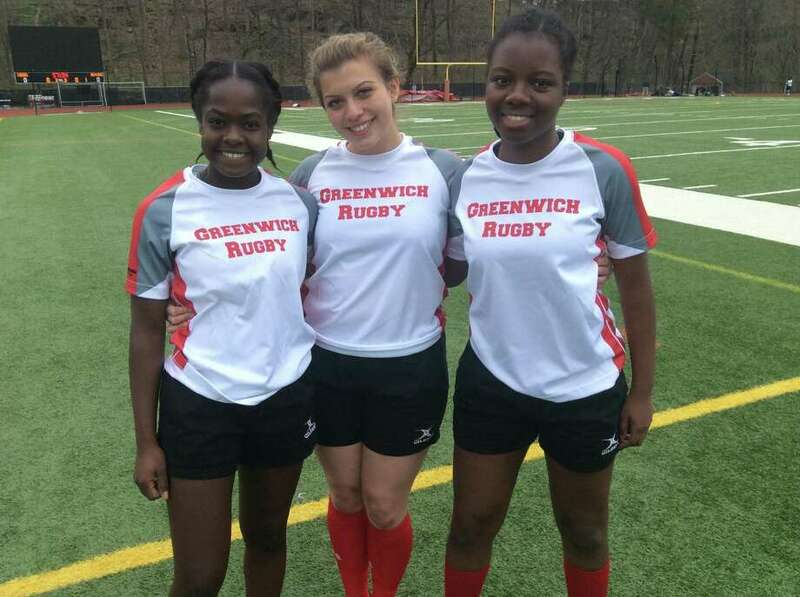 From left to right, Djuly Fleurant, Olga Wilson and Janel Codjoe are captains of the Greenwich High School girls rugby team, which is in its first season as a varsity program. History was made at Cardinal Stadium by one of Greenwich High School’s athletic teams Thursday night and the squad that did so happened to be playing the Cardinals’ newest spring sport. An intramural/club sport the past three years, girls rugby was introduced as a varsity sport this spring and the members of the inaugural squad couldn’t be happier. Coach Erin Martschenko has seen her team enthusiastically learn the fundamentals and nuances of the sport, which has drawn 53 players in its first season. As Thursday night’s match against visiting North Haven showed, the Cardinals are indeed, learning their lessons well. Seizing control from the outset, Greenwich earned its first win in program history, registering a 62-10 triumph against North Haven on Senior Night at Cardinal Stadium. The Cardinals’ first varsity rugby squad is captained by Djuly Fleurant, Olga Wilson and Janel Codjoe, all of whom can’t wait to compete in their new favorite sport each day after school. Greenwich lost to Southington, which is regarded as the top squad in the state in its season-opener and Fairfield in its second game of the season, before beating North Haven on Thursday. The Connecticut league includes teams such as Southington, Fairfield, North Haven, Simsbury and MidState. Remaining games for the Cards include Simsbury and MidState. Martschenko brings a vast amount of experience to her athletes. She played rugby at SUNY Stony Brook and SUNY Geneseo, then competed for the New York City Lions’ club program from 2000 to 20012, while also coaching the sport. Assisting her with the brand new GHS team is Joe Petrone, a Greenwich High graduate, who was an all-American while playing for the Cards. After dropping a 49-12 decision to powerhouse Southington in its season-opener and losing to Fairfield, 34-17, Martschenko liked what she saw from her team heading into Thursday’s matchup with North Haven — a game that saw the Cards put it all together. Martschenko has indeed, been busy coaching up her rugby players. Codjoe has seen the team make significant strides each time it takes the field. “We recognize since we are a new team that we need improvement, but we’ve shown great defense and passing skills — which we’ve worked on in practice,” said Codjoe, who plays at the flanker position — a role requiring a lot of tackling. Fleurant is a scrum half, who helps her teammates position themselves and get organized on the field. As for Greenwich’s convincing Senior Night victory, Mariana Garcia, a flyhalf, scored three tries and completed six conversion kicks. Emily Walko at the 8-man position had a productive game, scoring a try, while providing strong play on both offense and defense. Martschenko also credited Wilson and seniors Stevie Braverman, Falon Nethercott, Dolores Jonson, Maria Clara do Couto, Izzy Gutierrez, Silvana Carrion and Shannon Prong for also sparking the squad in its victory against North Haven.